The term "superfood" sometimes carries a stigma of being too overly-trendy or of-the-moment, gone-tomorrow variety since it's been used with such abandon. This week it's acai berry, next week it's chia seeds. While some of those foods definitely live up to the criteria of superfoods (whatever those criteria actually are), I think that there are some truly miraculous unsung heroes of the backyard garden variety. This week, Peanut and I got dirty and planted a garden in our little plot of land on this earth. My mom likes to buy my garden plants for me as my birthday present--the perfect gift for a health-loving lady. Peanut likes to help plant, but mostly he gets distracted by trying to find as many worms as possible while I'm digging. 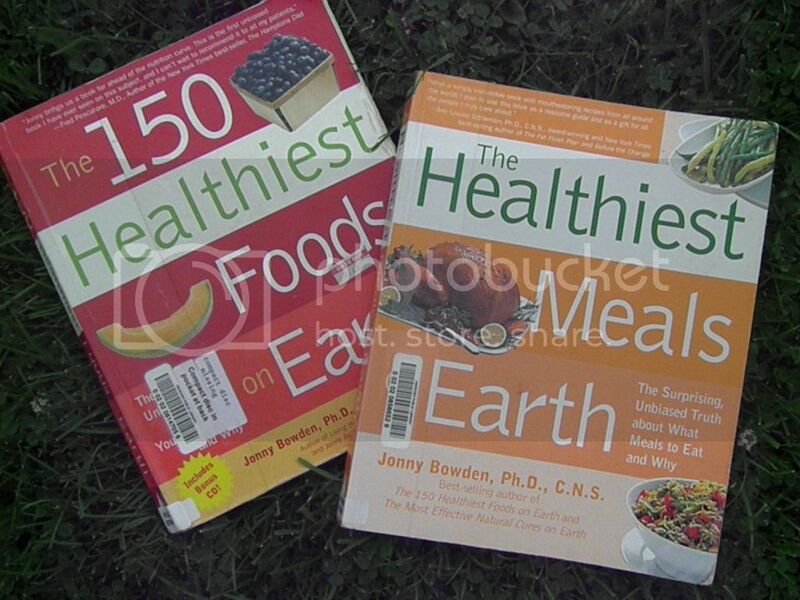 Here's a rundown of what we'll be harvesting this year and the corresponding health benefits from one of my favorite books, 150 Healthiest Foods on Earth. Bok choy: contains indoles which have been linked to a lower cancer risk. For a whopping one cup of the shredded vegetable (9 calories), you get loaded up with calcium, potassium, beta-carotene, and vitamin A. Green pepper: Loaded with vitamins C, A, K and potassium. Broccoli: contains isothiocyanates which shut down carcinogens, helping to prevent various cancers from lung to esophageal cancer. It can also inhibit the growth of some tumors, including mammary tumors. Lutein and zeaxanthin in broccoli have been shown to prevent macular degeneration. There are also other antioxidants, vitamins and phytochemicals that are scientifically proven to fight all sorts of cancers. It tops all experts' top 10 lists of healthy foods. Onion: Onion is hands-down a prime cancer-fighting food. The effects of onions on three cancers studied include stomach, prostate and esophageal cancers. They also help build stronger bones and significantly reduce mortality rates from coronary heart disease. Onions are highly anti-inflammatory, antibiotic, and antiviral. Sulfides in onions also may help lower blood lipid levels and blood pressure. Beans: Offers about 10% of the RDI of folate in a prime ratio of folate to amino acids that allows it to be absorbed properly by the body. One cup will give you about 4g of fiber and a bunch of vitamins and minerals: calcium, vitamin A, potassium, manganese, beta-carotene, lutein, and zeaxanthin. Tomatoes: tomatoes are of course rich in lycopene, which has shown to be a strong proponent against prostate cancer. Other strong evidence points to lycopene's effects on stomach, lung, pancreatic, colorectal, esophageal, oral, breast and cervical cancers. It's also a heart-healthy vegetable, reducing heart attack risk, slowing the thickening o arteries, and reducing blood pressure. Lutein in tomatoes is a protector of eyesight. Not only that, but they are also packed with other beneficial vitamins. Acorn squash: a fiber powerhouse, packing 9g of fiber per cup. In other words, they are highly filling for a very low calorie budget (115 calories). High fiber diets themselves protect against heart disease and cancer. It also is overflowing with potassium and even contains some iron. And I didn't plant just any ole tomatoes. This "Health Kick" variety definitely had my name written all over it. 50% more lycopene? Sign me up! I also had Peanut help me plant a small backyard herb garden--just about the only garden I haven't overloaded yet. Parsley: now, if I were going to invent some weird new-age cleanse diet, I would definitely add parsley to the mix. All kidding aside, the often "optional" herb is actually a strong detoxifier and deodorizer. The chlorophyll also helps to stop bacterial growth and counter toxins. The mild diuretic properties aid in kidney function. Diabetics may benefit from the herb's ability to reduce blood glucose levels. Oregano: Rich in a whole assortment of nutrients like calcium, magnesium, zinc, iron, potassium, copper, boron, manganese, vitamin C, vitamin A and niacin. It has an impressively high antioxidant content--more than most fruits and vegetables. Compounds in oregano have anti-fungal, antibacterial, anti-parasitic, and anti-inflammatory properties. It can actually inhibit the growth of at least 10 microbes. We also have a few beds around the garage for our perennial edibles, including asparagus, rhubarb, chives and mint. I could break those down for you too, but I'll leave that research up to you. They're all amazing powerhouses, I assure you. Now, you may be thinking that you need to own a 3-acre plot of land to grow this stuff. My garden is just 8' x 11' . Admittedly, I somehow tend to overpopulate my garden every year (at the nursery, my eyes are way bigger than my garden), but this small plot is definitely sufficient for your standard-issue salad fixings with all the health benefits. And let's be clear, gardening isn't just for cute retired grammies. It's also for anyone from the hip, urbanite to the low-income family. If you're ready celebrate the marvelous miracle of regular veggies, you're ready for a garden. See, and he's only four! Now, go get those pretty little hands dirty!